Today I’m going to show you an SEO Technique which will help you to grow your site faster! 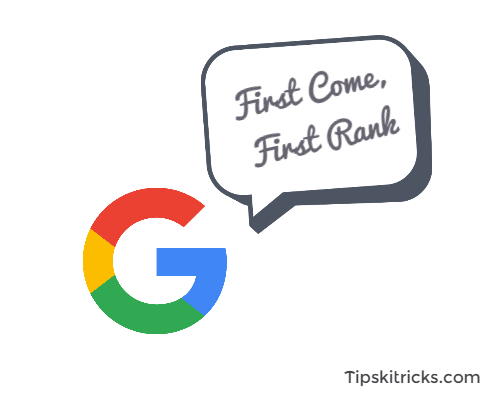 This technique is called First Come, First Rank SEO Technique! In facts, I’ve used this technique to get some quick followers and traffic to my blog! We all know that in a Flash Sale of any mobile, lots of people have registered to buy it but who buys on the day of Flash Sale? Yes, the people who come first get their smartphone but people who came late, they didn’t get anything! This formula applies in many places for example – booking movie tickets! This formula applies in this SEO World also, if you want to get a quick boost in your traffic then this formula will be Goldmine for you! This Technique is called First Come, First Rank Technique! The basic trick of this technique is that publish the article or content that is not written by many people but will get bunches of searches in the future! Keep Reading and I will show you how to find this type of content and how to get ranked fast! Let’s Brake this Technique into Step by Step! Step 1 – Find the content article that is not written by too many people! Step 2 – Make Sure that the topic you have selected will get many searches in future! Step 3 – Publish the Article! Only this much! How easy it is! But, how to find content that will get searches in the future but will not be written by many people in current time! How to Find Content that Will Not Written by Many People & Will Get Many Searches in Future? Look, I’m going to give example and with all these examples you will get an idea! Example – Let say SEO is popular in 2017 and we all know that SEO will be also popular in 2018 then you should write a post like SEO in 2018. Example – Do prediction! Yes, you can do the prediction for upcoming products and smartphones. Tricks: Write Before Anyone Else >> Make Sure Your Content Will get Searches in the Future >> Build Backlinks >> Wait for Some Time >> Done! Start doing this and your traffic will increase eventually! That’s sit, this is how this technique works!